Upweller consists of an 2.44m x 6.1m, (8' x 20') raft made of pressure-treated lumber, and a fiberglass trough with dimensions of 61cm x 2.44m, (2' x 2' x 8'). 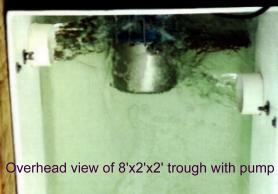 Inside the trough is a ½ horsepower, 110 volt, 5 amp pump, which is capable of circulating 800gpm (100gpm per silo). There are also eight 61cm x 61cm x 61cm, (2' x 2' x 2') fiberglass silos with stainless steel hardware and 2 sizes of interchangeable screens (not included, 1.5mm and 2mm available). The upweller's flotation consists of eight 2' x 1' x 4' foam-filled polyethylene floats. 0-700-A: component unassembled no lumber. 0-700-B: component unassembled no lumber no floats. 0-700: 2.44m x 6.1m, (8' x 20'). 0-700-A: 1.22m x 1.22m x 2.44m, (4' x 4' x 8'). 0-700-B: 1.22m x 1.22m x 2.44m, (4' x 4' x 8'). 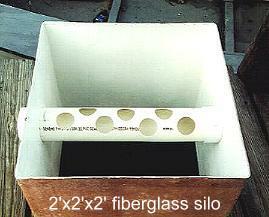 Nursery system for shellfish (oysters/clams). The FLUPSY is capable of growing 1,000,000 12mm shellfish per cycle. 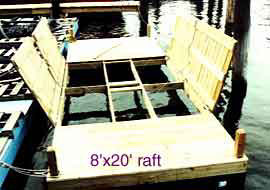 The raft floats in the selected location. This system works by causing nutrient-rich water to flow through containment areas (silos) in which (infant oyster seed2-3mm (1/16"-1/8")) have been placed. The water is first passed up through the screening in the bottom of the silo, past the oysters. It exits through the tube at the top of the silo into a trough, from where it is pumped back into the surrounding body of water. The water flow is constant, so the oysters feed (and grow!) constantly. Provides an intensive, controlled nursery system that force-feeds nutrient- rich water to the infant shellfish. That allows them to grow more quickly, have a higher survival rate, and conditions them to be always in a "want to eat" mode. In general, enhancing the grow-out abilities of shellfish reduces the time needed by the animals to reach market size, and that is a benefit to the grower's business. 1. Generally handle high volumes of product. 2. Can be moved to selected nutrient-rich sites dependent on the time of year. 3. Can be located closer to, or at the grow-out sites. 4. Amortization 8-10 years cost per animal 0.01.